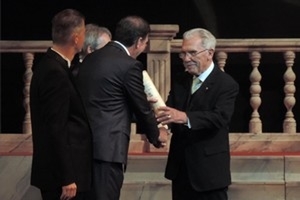 The Prima Prizes of the county Borsod-Abaúj-Zemplén, going back several years now, have been awarded at the Miskolc National Theatre this year. The Prizes are awarded to persons who contribute the most to scientific, cultural, educational and sports life inside the county. The competition is organized by the Association of Entrepreneurs, county Borsod. Awardees have been invited to a gala event, where they received the coveted prizes. Among the prize-winners we find ÓAM Ózd Steel that was chosen Steelmaker of the Year. Managing director Max Aicher represented ÓAM at the event personally and received the prize.